What happens when a student gets a question wrong? 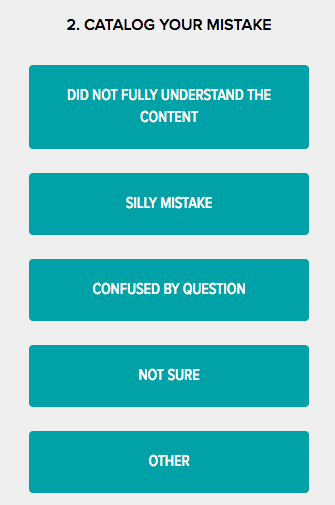 Here at Testive, we firmly believe reviewing missed SAT/ACT questions is more important than completing new questions. When students simply rush through hundreds of questions, they usually fail to reflect on their mistakes. This prevents them from understanding why their initial answer to a question was incorrect or improving their understanding of key concepts. Solution Videos: When a Student is using our software and get a question wrong, a "solution video" will automatically appear (example below). The purpose of the solution video is to walk the student through the correct process for solving the problem (both verbally and visually). Even when a student is prepping independently, solution videos ensure they receive instruction and support before their next coaching session. Cataloguing Mistakes: After watching the solution video, a student will be asked to "catalogue" their mistake (photo below). This process requires the student to determine why they made an error. Was it a "silly," or careless mistake? Or did the student misunderstand the question's underlying concept? This process is part of helping the student avoid similar errors in the future. Review Notes: After watching a solution video, and cataloguing their mistake, the student will have the opportunity to write a "review note" (example below). 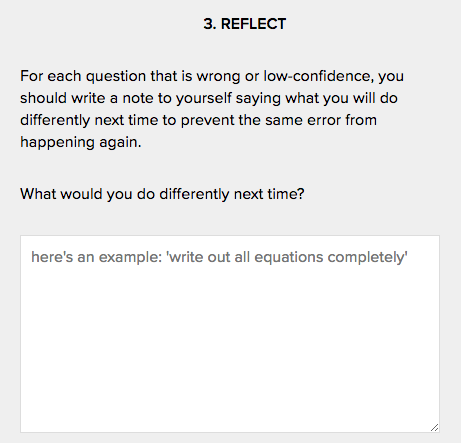 This note should be a reflection on why their initial answer was incorrect, and how they can apply this concept on a similar question moving forward. Students should regularly set aside time to look through their review notes, ideally at the beginning of each prep session. This ensures concepts they previously struggled with are now fresh in their mind. Coaching Sessions: If a student completes the process above for a missed question, and still doesn't understand their mistake, that's ok! Because Testive coaches monitor student work throughout the week, they are able to see every question a student misses and also have access to review notes. If a coach notices patterns in what a student is struggling with, they will address these areas of confusion during weekly meetings. In addition, students should come to coaching sessions with a list of questions they wish to review with their coach.